Teun van Heerebeek is a Dutch designer and artist. He’s also a watch lover and in 2015, he decided to combine his two interests: watches and art. 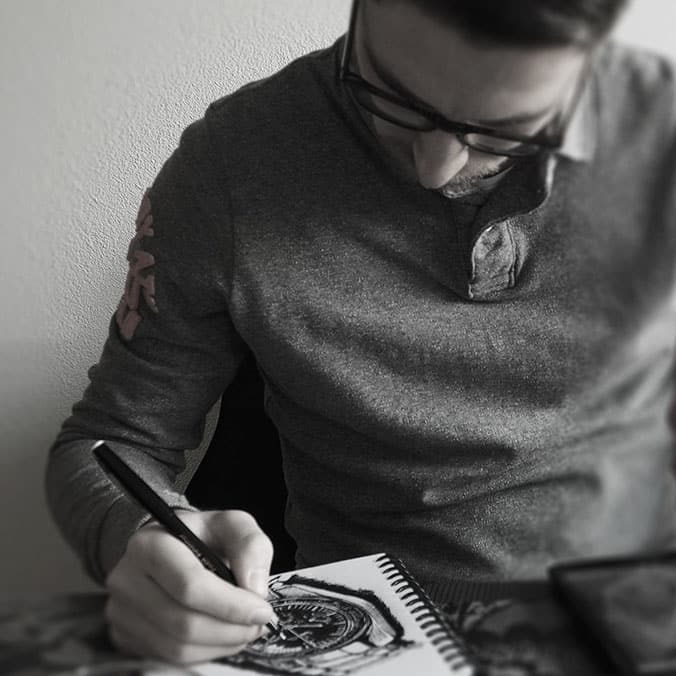 You might have seen his work on Fratello Watches because he’s responsible for the Watches and Pencils series. In this series, Teun often uses humor to create illustrations in a cartoonish way that are familiar to watch geeks. In 2017, he also launched his very own website and he’s quite active on Instagram. Out of an interest in details and design. Both are really important in the world of horology. I’m a perfectionist and watchmakers are always looking how to improve technique and design as well. These aspects always go hand in hand. I also like the fact that there are watches for all situations. You can wear one around your wrist at all times. It keeps the fascinating thing we can never control: time. Last thing: you can truly make a design statement with a watch. Unlike some other accessories, a watch is fully integrated into a man’s wardrobe. I’m a sucker for sports watches. I own a few of them, not too many. The Omega Speedmaster is definitely my favorite one. It’s such an iconic design with an interesting (space) history. Besides these, I own a Tudor Pelagos, Yema Rallye, and some other brands. Nothing too fancy and all are mostly functional but with a distinctive design. In general, I like watches that go by the ‘form follows function’ principle. I care less about the movement than the dial. If I had a large bank account I’d probably own some more exotic/extravagant pieces like an ultra-thin dress watch or a vintage Rolex (like a GMT master 1675 or an Explorer 1016). I’m willing to spend good money on a watch, but some have become too expensive in my eyes. Everything over 4500 euros has to have a very good story or unique properties to convince me of buying it. As already mentioned, that would be the Speedmaster. I recently got my Omega Speedmaster Speedy Tuesday limited edition with a special number; my birth year. So at this moment, it’s a no-brainer: the Speedy Tuesday. The size, curved lugs, and the so-called Radial dial. I love everything about this model. Rolex Daytona with a so-called ‘exotic dial’. There are a lot of other watches I like (for example, the earlier mentioned vintage Rolex models). When a brand succeeds in launching a uniquely designed watch these days, that’s what I consider a homerun. A lot has been done already and watchmakers need to be very creative and clever to launch something truly original. That’s why I mostly mention vintage models. I already own my grail watch: a pre-moon Speedmaster (145.012) with the iconic 321 column wheel movement. I’m a realist and don’t focus on watches that are way over my budget. I don’t own a watch with a white dial and this could be the one. Still quite affordable and from an iconic brand. The Datejust with its Oyster case is one of the most iconic watches of all time. You can’t oversee everything. If I’d start over I might succeed in the things that went wrong the first time, but fail on things that previously went right. The most important thing is to keep trying and holding on to your dreams. Not brand specific, but in my opinion, there will be more lesser-known (vintage) brands that’ll get the recognition they deserve. For example, when new historic facts pop up. So, not Rolex and Omega, but brands like Yema and Gallet. In addition, the so-called new-timers (late 80s early 90s) will start to get more expensive and sought after, now that the 60s and 70s vintage watches are slowly getting out of reach for most people. Focus on what you like and always ask other collecting friends for a second opinion before you buy a piece. Finally, where can we buy your work? My work is for sale over at the shop on my website. Click here to visit the shop.